Time for this month's Papertrey Ink Blog Hop! I haven't played along in quite a few month's but when I heard that this month's theme was 'Pretty in Pink' I was all over it with a little ombre on my first project. I am also linking these up to the newest Just us Girls photo challenge and Addicted to CAS. A shaker card for my second project. Thanks to inspiration from Donna Mikasa and video tutorial by Julie Ebersole. Thanks for visiting, enjoy the rest of the hop! These are gorgeous!!! LOVING the sequins!!!!!!! Two stunning cards Tracey. I love them both, but the shaker card is oh so fun! Love both cards. I'm really into shaker cards these days. Love that BIG Love You stamp. Oh my goodness they are both fabulous!!! Tracey..these cards are fabulous! 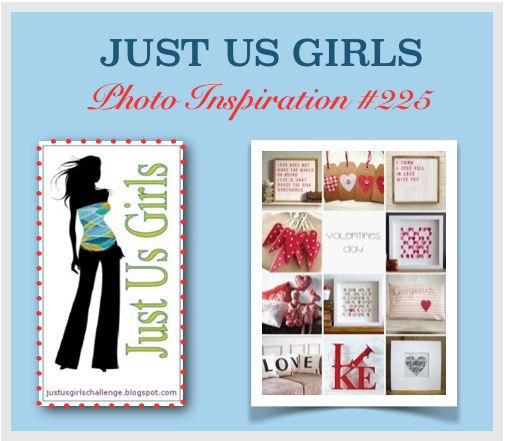 You should come by and link them up at Just Us Girls too! Love that shaker card too and yes it's hard to get the full effect of a shaker card standing up...lol! Both cards are beautiful! Love, love, love all of the hearts on the first one....so fun! Thanks for joining us at Just Us Girls! WOW! Love, love, love! :) Both are so sweet! Love the ombre hearts and the bling is the perfect touch. Love BOTH, Tracey but the shaker stole my heart! 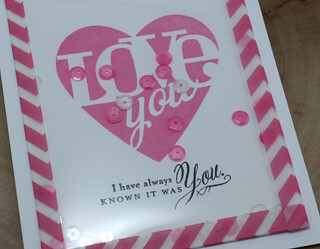 Love your heart card … reminds me of the one we all copied of yours in the summer… Love the pink! I have been making a lot of shaker cards lately but never would have thought to do the whole page…brilliant ! Love the sequins on the first card. Both cards are wonderful Tracey! I love the graduated color of the hearts and the shaker card looks like fun - the washi, sequins and PERFECT stamping - you got such a beautiful clean image! Wonders for inspiration, Tracey! Knew I would find some great ideas on your blog. Partial to shakers, so this is a fav! Beautiful cards, Tracey! I love them both. Your ombre and inlay hearts are so gorgeous. These are AWESOME!!! I love the ombré hearts, and that shaker is great! Now I wNt to go make one! :). Thanks for the inspiration! 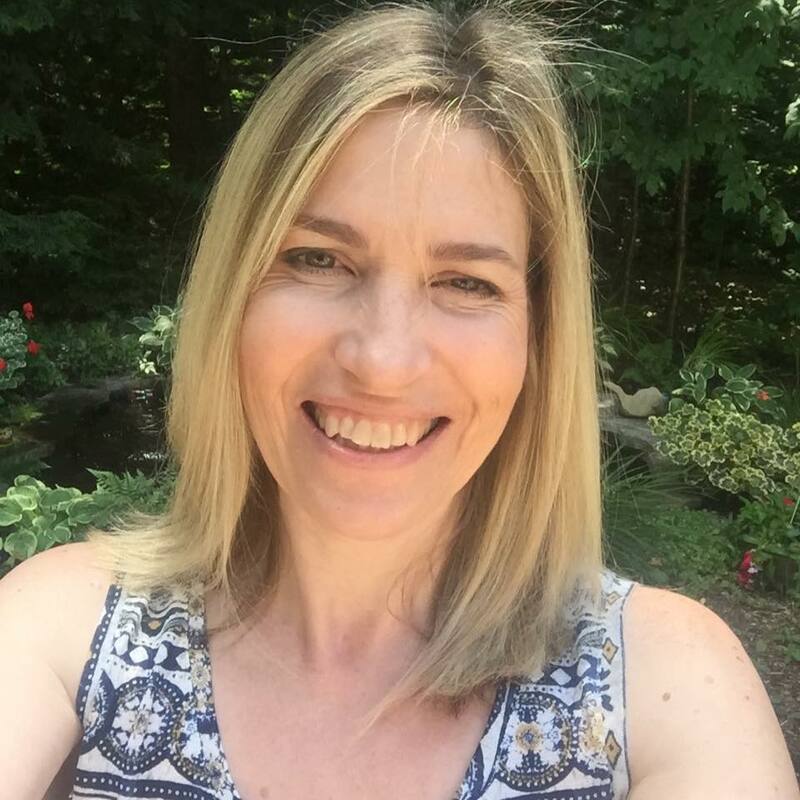 Two beautiful projects Tracey! love the colorful die cut hearts and that shaker card is so pretty! Great cards! Love all the pinks you used in the first one and the second one has an awesome CAS design! 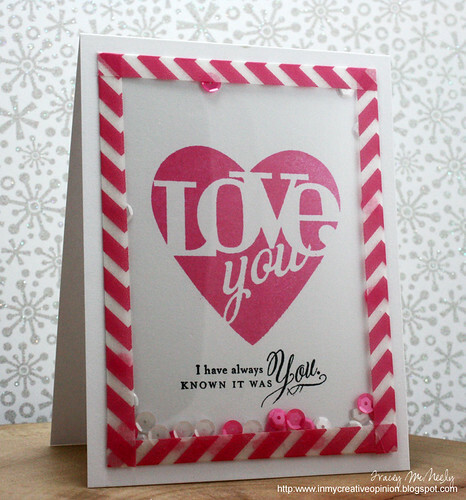 Love the ombre hearts card and your shaker card is pretty and fun. What a great pair of cards Tracey. The first one is so elegant and the second one such fun! Both of your cards are beautiful! I really love that shaker card! So striking! fabulous set of cards, tracey! Love the gradient effect you created on your heart card! Very cool! And I LOVE the shaker card! Just so pretty! Thanks for playing with Just Us Girls! Not just one but two super sweet projects! Hope you guys are staying warm! Both of these are so pretty Tracey! You rocked the challenge Tracey with these great cards. Love the shaker card especially. The frame is a nice touch. T-T-T-Tracey, beautiful Tracey.... I adore your cards, both so beautiful. The first one is my fave, so vibrant! Lovely cards and fun with the added sequins. These are both fabulous. So glad you did not miss out on the chance to use all that pink. How funny that you, Kim and I all did some version of ombre with that Hearts die. Looks like we were on the same page with our cards, Tracey! Very pretty! I also love your shaker card -- it's gorgeous! Well rock on with the comments! :) Fabulous cards love the die one a lot! Thanks for joining in at both JUGS & ATCAS! Fabulous cards, Tracey. Who doesn't like ombre and shaker cards are always fun. Two beautiful cards. You and I both did the ombre effect. I loved this challenge. The shaker card is lovely. 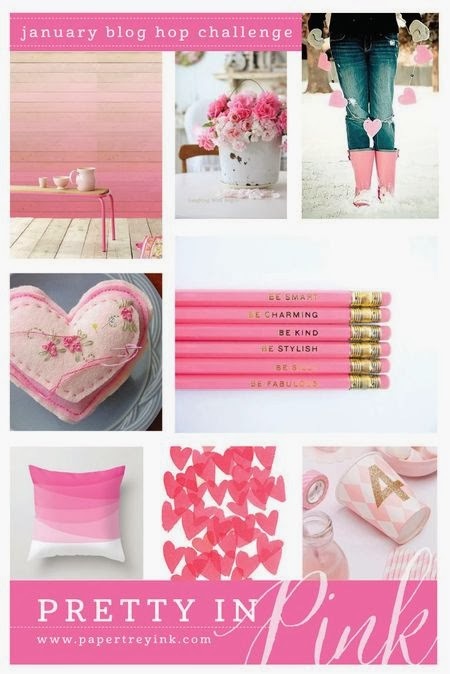 Love all the pink sweetness here, Tracey! And your shaker turned out great--isn't it fun to make? Julie is a genius! Tracey...so adorable!!! I love it and what I love more is that Joyce and I make similar cards, so fun that we all think the same, or maybe scary??? This is stunning! Love, love, love both cards!! The pink border totally makes me smile and the graduated pink hearts are fabulous!! I also love the sequins in both cards!! Absolutely fabulous! Oh myyy, Tracy, your cards are "beautiful in pink" ~ not just pretty :-) Love the ombre effect on the first and the sweet shaker card is fab too. Absolutely love both of your cards. 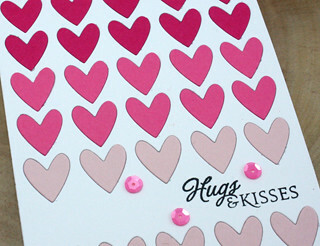 The hearts are so simple but effective and the sequins are beautiful in the shaker card. Really must try to make a shaker card, your has really inspired me!! crafty minds think alike! I LOVE the ombre effect on the first one and the shaker card is just TOO fun! wow both of these are amazing.. love those hearts and how you added the sequins.. totally awesome. Love both of your cards for the hop, Tracey! Especially love the ombre one with all the hearts! Love the ombre on the first card, but the shaker card is my favorite! Both cards are so cute. Love them. Two fabulous cards! Love the ombre hearts and your awesome shaker card! Awesome cards, Tracey! I must hold out on that cover plate, but it's so. hard. You make it look so darn good. Awesome shaker card with the washi! Both cards are lovely. Thanks for the inspiration! LOOK at all the comments...you are rocking with this blog hop with the gradients of hearts! I love that shaker card, too! You work wonder with the PTI die cut, Tracey! These are sheer perfection! I love how flawless every bit of your projects are...stunning designs! These are both fantastic! I love the ombre hearts, gorgeous. And that shaker card is so fun with the large shaker window. Thanks for playing with us at JUGS! Tracey, these are fabulous....LOVE the shaker card! Love, love, love your ombre hearts! and a shaker....squeal!!! Whoa! As in WOW x WOW whoa! Beautiful cards! The gradient pink hearts in the first are stunning; the shaker card as the second sheer delight! Fabulous, as always!